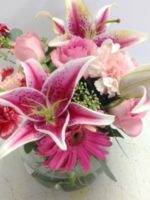 This arrangement is perfect for a lady like Lisa. 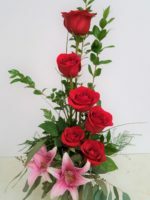 Great for a lady who likes pretty things such as pink roses and carnations, accented with a little “pop” of red! 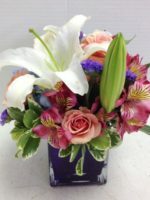 Lovely Lisa, named after my great-niece, is a festive and beautiful, fun floral arrangement, just like she is! 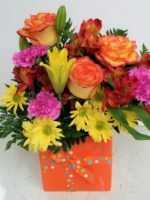 Lisa is a beautiful young lady who loves children and pretty things. 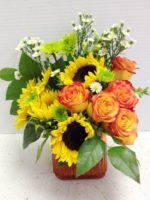 This arrangement is perfect for a lady like Lisa. 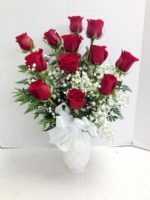 Great for a lady who likes pretty things such as pink roses and carnations, accented with a little “pop” of red! 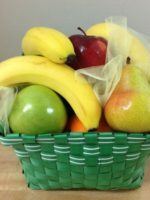 It’s not too large…it’s not too small… it’s JUST RIGHT! 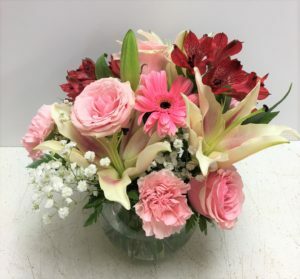 Perfect for Mother’s Day, a wedding anniversary, a birthday or a thank you, the lucky lady who receives this arrangement is going to be happy for a very, very long time! 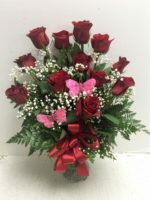 You might prefer our Butterfly Roses Bouquet or our Celebrate Spring!